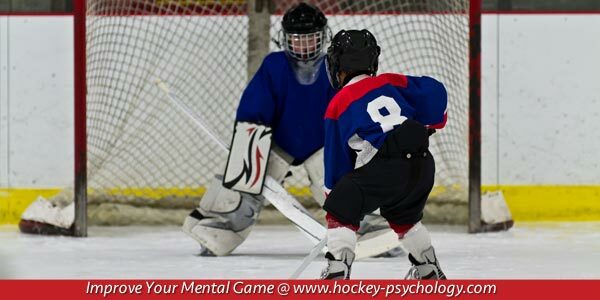 Hockey tryouts can be both mentally and physically challenging for young athletes. Your kids future on a team depends on how they perform during tryouts. Kids may feel nervous, unsettled, or feel more pressure to play their best. Young athletes may experience excitement or nervous jitters before and during tryouts. Athletes who feel jitters are the players who may under perform in tryouts. Some young athletes may have a fear of embarrassment or fear of making mistakes. Some athletes make comparisons with other athletes wondering if they are good enough to make the team, which is not always healthy for kids’ confidence. Some young hockey players are worried about impressing a coach or parent. Some athletes are held back because they lack confidence and have doubts prior to tryouts. Other athletes may try to perform perfectly and tie themselves up in knots doing so. In sports, most of the fear athletes experience to is not about being in danger or harming themselves physically, although in some sports like hockey, you can be physically injured. The fear I am talking about is a psychological threat that is often based on an athlete’s perception of the importance of a performance or game and what others think about his or her performance. Most of the time, an athlete’s fear is worry related to poor results (not making the team) – whether prior to or during a performance. Athletes often fear the negative consequences of their performance. They worry about many things that are often not under their control. The very first step is to identify the beliefs, attitudes, and expectations that cause your athletes to hold onto over-exactness in competition and lead to fear of failure. You want your athletes to keep the positive aspects of their mental game such as your motivation and commitment to sport. However, maintaining beliefs or attitudes that support a fearful, cautious, or over-seriousness attitude when performing does not allow kids perform their best. Thoughts such as “I must be perfect if I want to make the team today” or “I must analyze my mistakes and fix them right away so I don’t make the same mistake” cause kids to play tentatively. During mental toughness training, I teach my students about two mindsets that contribute to success in sports. The first is the training or practice mindset. Great athletes know the value of training. They strive to get better and to improve. They have a tremendous amount of motivation and work ethic, which help them to practice hard so they can master their skills. The trusting or performance mindset is equally important for success in sports. Trust is the ability to let skills “happen” instinctively by relying on practice instead of consciously directing movements. The performance mindset is the ability to rely on practice, perform freely, and allow skills to flow without excess thought. The bottom line… If your athletes are stuck in the practice mentality when they compete, they will limit their ability to perform their best because of too much analysis, trying too hard to be perfect, and a loss of trust. 3. Focus on Self not Others – Make No Comparisons. Your athletes must start with the understanding that most intimidation in sports is self-induced. Yes, other athletes will sometimes use direct intimidation or play head games with your athletes, but they can make the choice to not pay attention and look the other way. However, your athletes can’t “look the other way” when they are their own worst enemy because they are intimidated by their own thoughts about the level of the competition, the rink conditions, or the venue. Athletes who lack confidence often look for others to help them feel confident. Likewise, these same athletes intimidate themselves by paying too much attention to other hockey players or by putting other hockey players on a pedestal. Most self-induced intimidation comes from your athletes giving too much energy to other competitors by making comparisons, thinking too much about the reputation of their competitors, or feeling like they do not belong at the current level of play. Help your athletes avoid putting other athletes on a pedestal, as if they are better than your athletes or superior. Help your athlete stop making comparisons to athletes who they think are better. Help your athletes focus on their strengths instead thinking about the reputation of other competitors and how they stack up. Help your athletes see themselves on equal ground in terms of their ability. 4. Play for Yourself, not Others. Social approval is an important phenomenon in my discussions with athletes that I coach. Many athletes rely too much on social approval to boost their own levels of self-worth. Some athletes think that if others respect their sports performance, this, for some reason, will make them a better person. Many athletes buy into this notion and think that they are better people if they can achieve acknowledgement, gain approval or respect from others through sports. For many athletes, a huge source of worry about their performance results from the need to seek “social approval” from others. If this is your athletes, they might have a need to be admired, accepted, respected, or liked by other people. They worry about performing poorly because it may have an influence on what others might think about them. Thus, athletes who want approval from others can become anxious or are afraid to fail in competition. The need for social approval is the root of fear of failure. But this story gets even better. What happens when your athletes want approval, but can’t get it? Does this affect how they feel about themselves as people? For most of my students, yes! Athletes want approval from others so they can feel better about themselves! Help your athletes understand why they value (sometimes too much) others’ opinions. Help your athletes have self-respect not other-based respect. Help your athletes stop the mind reading or thinking too much about what others might think. Help your athletes know who they are on the inside. They should define who the person is first – called self-concept. Help your athletes separate self-esteem and performance. Too often, athlete judge themselves on their performance in sports. 5. Play Functionally – Don’t try to be Perfect. A functional mindset is the opposite of trying to make everything perfect. It starts with the idea that your athletes DO NOT have to be perfect to perform their best. They are human and humans can’t be perfect. Your athletes will make mistakes and you and your athletes have to accept mistakes. Tennis coach to professional players, Brad Gilbert, calls the functional mindset “winning ugly,” which he wrote a book about. Have your kids use the warm up to get a “feel” for their performance. Don’t have them practice their game to control it. Remind them not judge the quality of their technique or performance in the warm up. If your athletes miss a couple of shots, tell them not to fret over it. Your athletes should let go of the need to control their performance and let it happen. Have your athletes think “win ugly.” Use whatever works to help them get the job done in tryouts. For example, instead of needing to execute a play exactly from the playbook, be happy with a play that worked well, but maybe was not “textbook” execution. Help your athletes use what’s working. Stick to what parts of your athletes game are working well. Have them use their strengths instead of what they are supposed to do. If your athletes are not hitting a wrist shot well, tell them not to force themselves to hit a snap shot. My definition of self-confidence is how firmly athletes believe in their ability to execute a physical skill or perform a task. That’s right–confidence is how strongly an athlete believes in his ability to execute a play. Confidence is derived from a baseline assessment of past performances, training, and preparation. As your athletes’ competency or skill mastery grows, their confidence becomes proportionately stronger. I think of confidence as a cure-all for what ails athletes’ mental game. If athletes have high self-confidence, it’s very hard to get anxious or tense, or worry about results because they already know that they will perform well. With high confidence, they don’t fret about the competition. With confidence, they are relaxed and focused on the correct performance cues. Do you get my point? Doubt is the number one killer to a confident mindset. Pessimistic, perfectionistic and over-motivated athletes tend to hold on tight to doubts, which if unchecked can ruin an athlete’s mindset and derail performance. Some athletes start doubting before they even start the competition or make an error. Most athletes struggle with doubt after making a mistake or performing poorly in competition. When they let doubt run rampant and unchecked, it sabotages confidence. However, athletes who can recognize doubt and turn it into statements of confidence can counter the negative influence that doubt may have over them. The first step in overcoming doubt is to become aware of the thoughts that deteriorate confidence. The next step is to counter the doubts with thoughts that will lead to better outcomes. 7. Focus on the Process, not Results. Your athletes have the unique ability to selectively attend to what they want. This mental skill comes in handy when they perform, but only if they focus on the right performance cues. Your athletes objective is to focus their attention on performance “cues” which help them perform their best. A performance cue is any thought, feeling, or image that helps you execute. A hockey player might feel his wrist snap on the shot. Understanding what is not relevant is an important step in helping your athletes improve focus by understanding their distraction. Many of the athletes I work with tend to overload their brains with too much information – more than they can handle at one time. Information overload or having misleading information sends mixed signals to the body. In this indecisive state, the body will not execute with the desired outcome or rhythm. Once your athletes define performance cues and can clearly recognize non-relevant cues or distractions, they are now in a better position to become fully immersed into their performance – an important quality of being in the zone or gaining a zone focus. Unimportant cues or distractions might be thinking about missing a previous shot or what the coach might do if you lose the puck. Learning any new skill takes time. It does not matter if your athletes are learning physical skills or mental skills, repetition and application is necessary to make it part of everyday practice and performance. Helping your athletes commit to improving their mental toughness over time, (even when your athletes are performing well,) will lead to a consistent mental game and performance in any situation including tryouts. i thnk this information is helpful because i have a hockey tryout tonight at 3 and im an 8th grader playing high school hockey and im REALLY SCARED!!! sooooooo thanks for the tips!! I used to play tier 1 hockey but the 2 years prior to this year i was released. This year i did not tryout for the team because i was worried that i did not have the potential and capability to play at this level this year and was nervous that i may be cut and would be disappointed again. Unfortunately i only read this now but i believe that these tips would have strongly motivated me to relax and just go out and give it everything i had. Thanks for the helpful tips i will use them for my AA tryouts tomorrow. Glad it will help you with tryouts. Thank you for writing this. This made me think differently for my wildcat tryouts today. I’m still very nervous of screwing up; this still helped me calm down. Thank you very much!